The quarter-round molding under my front door came off recently when I opened the door. The molding was attached to the doorsill with two different kinds of adhesive. 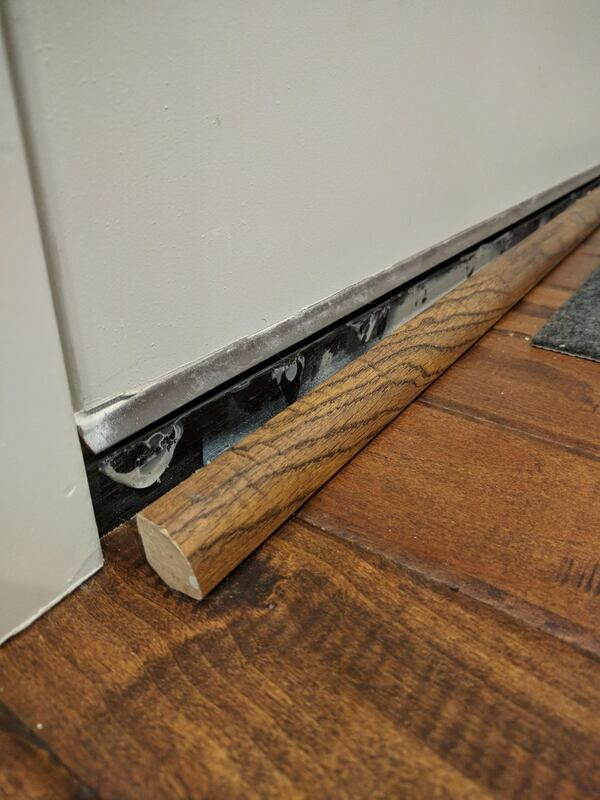 Apparently the rubber weather strip under the door has been sweeping against the molding every time the door opens, and the adhesive finally gave out. Just glue the molding to the doorsill again. My main concern is that the molding will just come off again due to the ongoing force of the weather strip sweeping against it. (The weather strip seems to apply quite a lot of force along the entire length of the molding, I've found by trying to hold the molding in place with my hands while opening the door.) Or maybe it would be fine; it seems like the original installers maybe didn't do an awesome job, as I saw big drops of glue that looked like they had adhered to only one of the two facing surfaces. Advice on what kind of glue or adhesive to use would be helpful. Try screwing or nailing the molding to the doorsill. Maybe screws or nails would have better tensile strength than glue? However, I'm not sure what the doorsill is made of. It has a wood grain texture on the surface that feels maybe sort of fake and I don't know whether there's real wood on the inside. I'm not sure I can productively screw into it. I'm also worried about splitting or weakening the molding, and about the difficulty of drilling precisely into a round surface. Try to sand down or otherwise somehow reduce the height of the molding such that the weather strip on the door clears it, so that the molding is no longer under tension when the door opens. It looks like I would have to remove several millimeters. I'm not sure how to go about doing this. Is there a particular power tool I would use for this? Buy new quarter-round molding of smaller radius. This molding is ¾″ tall, so maybe I should replace it with ⅝″ or ½″ molding. It seems like it might be hard to find molding that matches the floor as perfectly as the existing molding, though. I have no prior experience with this sort of thing but am interested to learn and would appreciate any advice on what approach to take. Eventually I noticed that the molding was not actually ¾″×¾″ as I had thought, but rather ¾″×⅝″. When I flipped the molding around so that the ⅝″ side was vertical and the ¾″ was horizontal—orienting the molding so that it was effectively shorter, just ⅝″ tall—the door began clearing the molding easily and no longer exerted force on the molding with each opening. I simply attached the molding in this orientation with Liquid Nails Perfect Glue, which is the adhesive I had on hand, and it's had no problems since. Thanks to those who suggested solutions! If it's in good condition I would glue it back on with liquid nail that stuff is like the duct tape of glues. 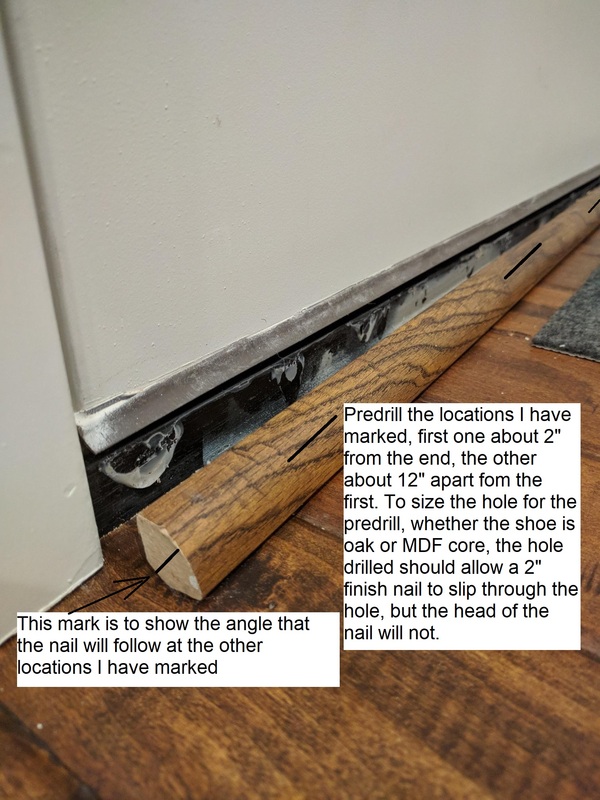 Once you get the holes size gauged for the finish nails you will use, you will need to drill the holes once the shoe is in place to a depth of about 1". To help accomplish this, use a small piece of tape 1" from the end of the bit so when your tape touches the shoe, you know you are at the right depth. Your nails should slip into the holes you just drilled and when you drive them in, what has not been drilled will hold the nail securely. Drive the nail flush, or near flush, finish it off by setting the nail below the surface of the shoe with a nail set. They come in sizes, use the one that is the smallest, typically called 1/16"
Not the answer you're looking for? Browse other questions tagged repair wood doors trim adhesive or ask your own question. What primer and paint should I used for a solid-core wooden front door? How do you remove stick-on hooks? How do I deal with glued-on drywall? How should I go about refitting the seal under this interior door?